There aren't a lot of automakers left selling traditional wagons in America. 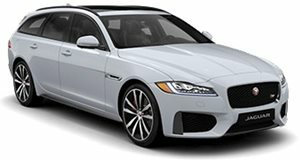 Jaguar is one of the few, offering its XF Sportbrake where others don't. But it won't for much longer. Jaguar's US-market chief Joe Eberhardt told The Detroit Bureau that the extended-roof version of its mid-size sedan is one element of its lineup that it'll soon withdraw from the North American market. Another is the manual transmission, which was recently discontinued from the US-market F-Type sports car. In their place, the British automaker will (to no one's surprise) prioritize producing and selling crossovers. Though the news may be disappointing to some, we can hardly blame the manufacturer for following the money as its profits plummet. At about one quarter, Jaguar's sales paled in comparison to what it's sister-band Land Rover sold in the United States last year. And of those 30,000 models the Leaping Cat marque did sell here over the course of 2018, the F-Pace and E-Pace accounted for the proverbial lion's share. While the company doesn't break down its sales by bodystyle, it only sold 2,308 XFs here altogether last year. And we'd bet only a smaller portion of those were Sportbrake wagons. No timeline was given for the XF Sportbrake's withdrawal, but once it's gone, it'll leave only a handful in the segment. So if you want one, now's the time to place your order. Because once Jaguar pulls the plug, upscale wagon-buyers will essentially be left to choose between the Mercedes E-Class and Volvo V90 (and the less conventional Porsche Panamera Sport Turismo), or else resort to smaller alternatives like the BMW 3 Series and Audi A4 Allroad. And who knows how much longer any of those will hold out as the relentless encroachment of the crossovers marches on.